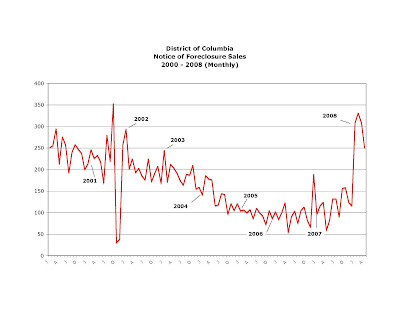 While processing the District's foreclosure data for April 2008, I wondered whether that month's number of notices of foreclosure sale was abnormally high. There have been many press reports about the spike in the number of foreclosures nationwide and I was curious whether the District was in line with the national data. 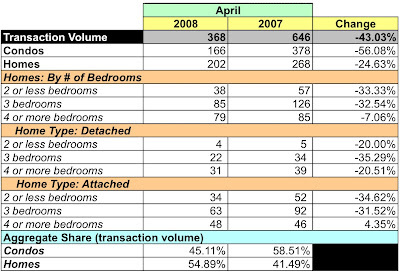 While the volume in 2008 is much higher than that of 2007, how does it compare to 2006? Is 2008 an anomaly? To answer the question, I got my left-brain and browser to work and collected the District's monthly notice of foreclosure sale data for 2000 - 2008. I researched that span of time because it predates the housing boom/bust and the Internet bust and, I hoped, would eliminate data distortions those events might engender. Understand: I'm not a statistician so I didn't calculate standard deviation, perform a t-hat test, or anything like that. Interestingly, the data show that 2008's rate of notice of foreclosure sale, while high through April, is only 18% higher than the same period (January - April) in 2000, but it is almost triple that of 2007. Beginning in 2001, the aggregate number of notices declined YoY until December 2006, when the upward climb began. A question that comes to mind is whether, in the context of foreclosures, the market's returning to normalcy? Moreover, why the fall in the number of foreclosure notices beginning in 2001 - is that directly attributable to the Fed's easing of interest rates? Or is more related to the fact that in the housing boom, it was easier to sell and escape foreclosure? I trust everyone had a great Memorial Day holiday. I'm working on April's foreclosure data in an attempt to map those homes and condos that have received notice of a foreclosure sale. The data are more difficult to work with than I expected, but I hope to have this completed by next Monday. When I should be thinking about laying on a beach chair by the pool, I'm instead trolling through the Recorder of Deeds database to see if I can discover the number of foreclosure actions in the District. Turns out you can. My database excursion was prompted by someone who wanted to know how to determine whether a particular property is going into foreclosure. I did a search on "Notice Foreclosure Sale" for April 2008 and discovered that 250 notices had been filed. That's compared to 59 in April 2007. How not to sell a million dollar house? My partner and I went to Rodman's this past Sunday to pick up a few odds/ends. As we entered the parketing lot, we noticed this house at 4316 Garrison [MLS #DC6675779]. From the outside, it looked like your typical red brick Colonial in Northwest DC. The "Price Reduced" sign caught my eye. Upon returning home, I fired up the laptop and Googled the address, quickly finding the home on several web sites. It's a 5/3.5 home whose owners, by looking at the home's photos, don't believe in white walls. It's currently listed at $1.099M, down $90,000. The fellow who owns it doesn't live in it; the District has it assessed at $963,390. After looking at the home's photos, I have to wonder whether the real estate agent is really trying to sell the house. I look at the listing and stand back in wonder. "Will review all offers"? What else are you going to do? 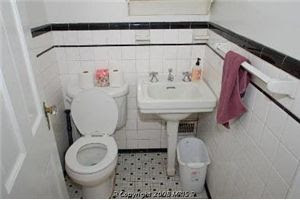 You post a photo of the home's luxurious half-bath [photo 7] with the toilet seat up without bothering to remove or straighten the hand towel? You can't be bothered to make up a bed [see photo 9]before taking its picture and posting it on the web? This is going to entice me to drop more than $1MM on a red brick square? And they wonder why they had to take a $90,000 price reduction. 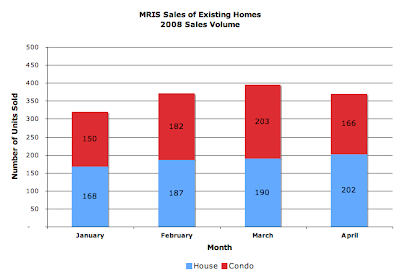 MRIS has released its data for sales of existing home sales in April 2008. 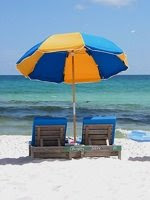 Fewer units sold, lower dollar volume, condo prices down, single family home prices up. 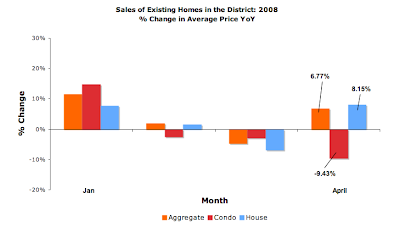 The severity of the downturn in the District is striking. The condo market appears to be in free fall. 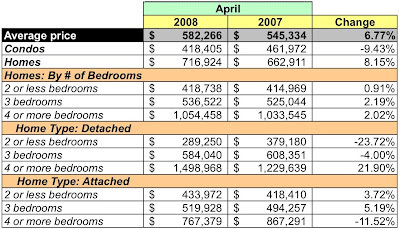 High end homes are propping up average prices; as I noted in yesterday's post, approximately 10% of units sold were valued at more than $1MM. Dollar volume: $ 210,508,482. Down 39.18%. Units sold: 368. Down 43.03%. Average sales price: $ 582,266. Up 6.77%. Median sales price: $ 438,000. Up 4.53%. Sales volume. Overall, down 43.03%, worse than March, which was worse than February. YoY, condo and home sales volume pierced the basement, down 56.08% and 24.63% respectively. Sales volume was negative across the board, except for 4 bedroom attached homes. Condos represented less than half of the units sold, 45.11%. Dollar volume. In aggregate, down 39.18%. YoY, condos were down 60.23% while homes were down 18.49%. Dollar volume was negative for every category of housing. Average sales price. Overall, up 6.77% YoY. Condos fell 9.43% to $418,405 and homes rose 8.15% YoY to $716,924. Inventory. Based on the month's transaction rates and active listings, there is a 10.34 month supply of condos, a 29.77% increase from March, while home inventories are at 9.41 month's supply, a slight 1.59% decrease compared to March. The downward trend that began in July continues. 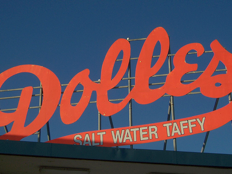 We went to Rehoboth Beach this weekend for a quick getaway. While it was too cool to hit the beach, it was nice to stroll the boardwalk, shop a little, and park anywhere we wanted to because there were no parking meters! Apparently, the parking meters take the season off, too - none to be seen, they'd actually been removed from their pedestals. Ah, joy. The $2, generously sized mimosas at the Blue Parrot were a treat as well. I also noticed a few properties for sale with the magic word "Reduced" noted next to the price. 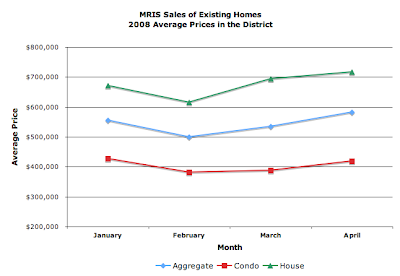 Oddly, the average price rose 6.77% and the median price rose 4.53. A quick count showed that almost 10% of units sold for more than $1MM. The high end continues to skew the market. Recently I was looking at District records for a condo I was interested in. The owner has listed it for sale at $759,000, a mere $17,000 more than he paid in 2005 [basically, he's selling it at a loss when his sales costs are considered]. However, what caught my attention is the District's real property assessment for the condo. According to the District's database, the property's current full value [before the homestead exemption is applied] is $662,570 and its proposed new value for 2009 is $581,050. As far as the District is concerned, the condo has lost 21.7% of its value in three years. But this is simply one condo in a building of three condos. Is there a trend? What is the District projecting for other, larger buildings? Well, I decided to revisit an old friend, Cityline at Tenley [you may recall my post about the building], to find out. I compared sales data for the building against the District's real property assessment database. I found that of the 188 units that have sold, the assessed value of 68 has increased while that for 120 units has fallen. In other words, the District values 120 units at less than their last sales price, and some by a substantial percentage. Interestingly, an unscientific sampling shows that no unit with two bedrooms has an assessed value higher than its last sales price. Why? I don't know. For each unit sold in Cityline, the table below lists the District's 2009 proposed assessment value compared to its last sales price. Use the scroll bar on the right to browse the table. One may not agree with the District's real property assessment methods and one can argue that the District's proposed assessed value is not really an accurate reflection of market value, but it's important to note that the District is preparing for a large drop in property values since the property taxes that flow as a consequence of these assessments obviously affect the funds available to operate the District in 2009. Jeremy Resnick is with Upside Down Florida, a firm that helps homeowners who owe more on their home than it's currently worth. He said one client was just handed a bill for $40,000 to help cover an association fee shortfall. JEREMY RESNICK: In some communities, there's been an assessment for $25,000 and three months later, another assessment comes for the same amount of money. This isn't just a problem in Florida. Resnick says 51 million people in the U.S. live under a homeowner or condo association, and nearly all of those communities face some financial fallout from foreclosures. RESNICK: In the bigger areas, in the Miamis, in the San Diegos, in the Phoenixes of the world, these are $50,000 and $100,000 assessments. By law, unit owners have to pay these special assessments. Resnick says the danger is that huge assessments could tip even more owners into financial crisis. RESNICK: It's just a cascade effect of where, if you keep reducing the number of residents, you're ultimately going to raise the dues for everybody else that remains. And when people can't take it anymore, it usually means the death of the community. I can't even imagine how I'd react if I received a $40,000 assessment that I had to pay... Pass out the smelling salts!